Lately we have seen a growing interest in DOGE coin on twitter, where more that a few well known figures mention DOGE coin. In the past week the buy volume spiked to 17 Billion coins on Bittrex. This is the biggest buy ever so something must be going on. This would be a long a risky move, but if it pays of, some people would get massive profits. 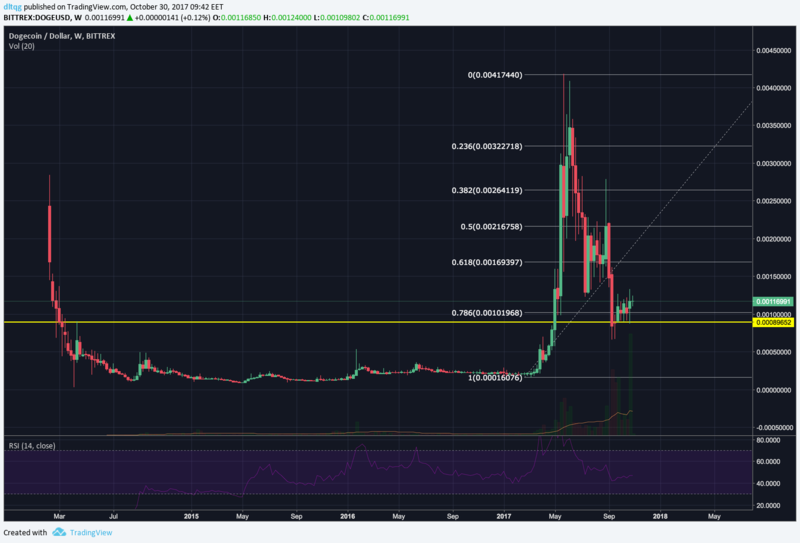 We can see on the chart the previous happenings regarding DOGE. A lot of people laugh but this is one of the most stable and predictable coins out there. Looking back, it's usually passing the previous high, so if everything goes as planned, we could see DOGE over 190 satoshis. Looking in to the $ chart, things look a bit different but still, we can see a bounce to the 0.5 fib level after it stabilised on the 0.618 level. Anyway, the situation is getting interesting, people are mentioning it and a revival of this coin would be fun.